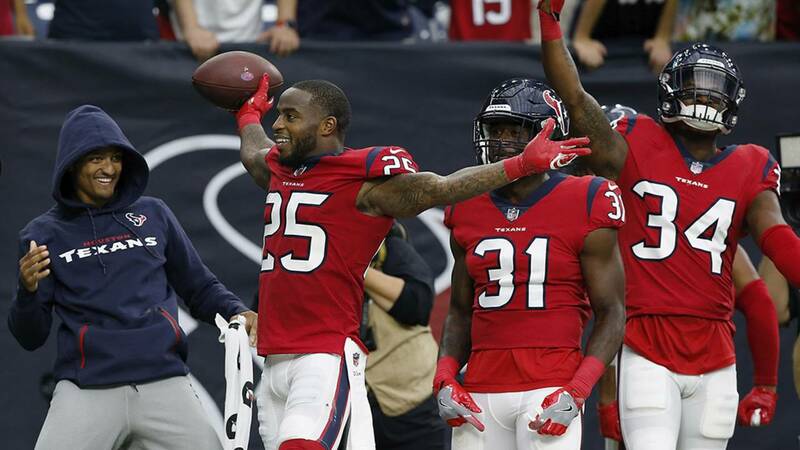 Kareem Jackson #25 of the Houston Texans celebrates with teammates after an interception in the fourth quarter against the Buffalo Bills at NRG Stadium on October 14, 2018 in Houston, Texas. HOUSTON - Here are several deals and promotions Texans fans can grab when the team wins a game. All promotions will be available the day after a Texans victory. Receive 50 percent off online pizzas at Papa Johns when you enter Texans as the promo code. More than 40 Houston area Palais Royal stores are offering 40 percent off one item when you say "Go Texans" or enter "Go Texans" online. Mattress Firm is offering a chance for fans to win a VIP Houston Texans experience for the home opener Sept. 23. Firehouse Subs is offering a free sub when you buying chips and a drink. Texans fans can participate in the Chevron Cars Challenge by downloading the Chevron mobile app for a chance to win a $100 Chevron Gift Card. Houston area Ford Dealers are offering Texans fans a chance to sit in a TORO's Ford F-150 as it leads the Houston Texans out of the tunnel on to the field on gameday at NRG Stadium.